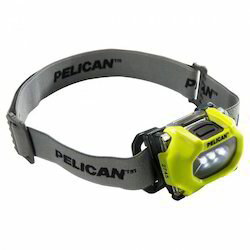 Our product range includes a wide range of pelican mity lite 1900 flash light, pelican mity lite 1965 led flash lite, safety flash light 2000, pelican 3715 led flashlight, pelican 3315 led flashligh and pelican frameproof headsup 2640 headlight. 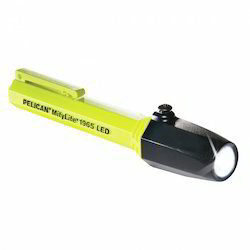 MityLite™ 1900 Flashlight uses a hi-intensity Xenon lamp that produces a powerful, bright yellow beam to cut through thick smoke, fog, and dust. It is submersible and with a twist-on shroud. Powered by 2 AAA alkaline cells. 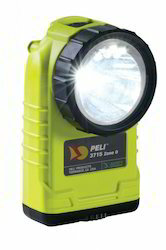 Excellent Personal intrinsically safe light available in white, Yellow, Orange, Black, Blue and Neon Green colors. Mitylite 1965 LED Flash Light Long lasting, energy efficient, bright LEDs, safety approved light. Small enough to fit in your shirt pocket, yet bright enough to illuminate your work area. Personal Light series. Available in Black and Yellow colors. 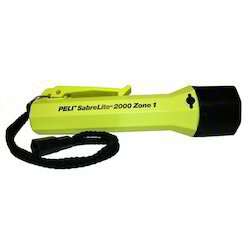 SabreLite™ 2000 powerful flashlight carries a variety of SAFETY approvals, allowing safe use in many different hazardous environments and conditions. The SabreLite is o -ring sealed with a twist-on shroud and comes with a polarity battery guard tray that safe guards against dangerous "outgassing" of hydrogen from an accidentally reversed cell. It is submersible, and has an ABS resin body which resists chemicals, corrosion, and extreme temperatures. The SabreLite ' s incredibly bright Xenon lamp produces a powerful collimated white beam. Available in Black, Orange and Yellow colors. 3715 LED Flashlight leads the way yet again with its new right angle light features 174 lumens (high) and 95 lumens (low), and a signaling mode. Another first is a built in battery life indicator so you will know your light’s battery level before you go in. Compact, rugged, and lightweight, the 3715 LED light contains the latest technology, Pelican’s legendary build quality and lifetime guarantee of excellence. The new 3315 LED flashlight: the lightweight compact design houses 3AA batteries that power a single LED for 110 lumens of super bright LED light. Safety approved for the most volatile work environments, the 3315 LED flashlight is one of the most efficient flashlights on the market today. elican HeadsUp Lite™ 2640 Headlight is a powerful Halogen/LED combo hands-free light for any task, big or small. Flip the switch up and you've got 3 LEDs: bright and efficient. Perfect for close-up work and tasks that require intense white light. For jobs that demand a powerful beam, flip the switch down for the halogen mode. Cut through thick smoke and dust. The body is tough ABS resin that's corrosion proof and resistant to extreme temperatures. The 90° pivoting head allows you to aim light right where you need it. The light weight battery pack houses 4 AA alkaline cells (included). The 2640 comes with a rubber strap for hard hat use and an adjustable cloth strap for bare head. Pelican safety approved headlights are designed for use in hazardous environments. They are not only Class I Div1 approved but also shine bright (up to 100 lumens) and burn long (up to 40 hours). Additional features include downcast LED s for illuminating your path, and a battery level indicator so you won’t be left in the dark. IPX4 water/weather resistant polymer construction. They also pivot to a 45 degree angle to direct clean, brilliant light where it’s needed. Each weighs in at just over 3 ounces with three AAA batteries (included) and include both a rubber strap (for helmets) and a cloth strap (comfortable for bare heads). 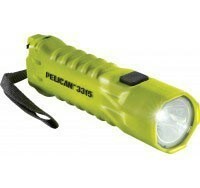 Looking for Pelican Flash Light ?